As Dad opened the front door, I danced around him like an excited puppy. He had bought dinner and I was starving, which was probably my own fault. 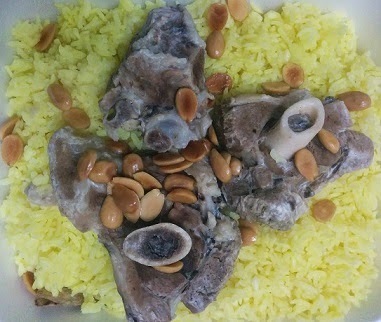 We had a traditional Jordanian dish called Mansaf, and it looked beautiful to me. It was delicious too. But Mom did not fall in love with it as much as I did. In December we are having our annual day, and nobody knows who the chief guest is going to be yet. I want to do a group song, so I am going for song selections. Since Annual days are important, the school timings are usually extended so that the participating kids can practice. This time, the timings have been extended from 12:40 to 1:00. Do you remember that Malaysia trip I told you about? Well, now it has been cancelled because very few people are going. So, we get to have a normal trip this year. Everyone is guessing that it will probably be to Al-Hokair again since most of us wanted to go there again. Besides, you don’t get cotton candy at Star City. Nobody wants to go to a mall either. Now is actually the perfect time for a trip. Since it’s the beginning of winter, the temperature is just right; neither too hot, nor too cold. When we went to Star City, it was so hot, you could have fried an egg on our heads. Out of the 10 riyals I had, I wasted 5 riyals on buying cold water. The best part of going on trips is that if you carry about a minimum of 10 to 15 riyals with you, you can buy something from the stores, from cotton candy to cocktails to wonky hats and glittery plastic sunglasses. And going on lame shopping is actually kind of fun.